Has this ever happened to you? You make a one pot of tender and juicy braised venison roast (or other big game roast), with potatoes and other earthy root vegetables that is off the hook. The whole family loves it, but you end up with leftovers. The next day, as you poke around the refrigerator for some rib stickin’ grub, the cold leftover venison roast doesn’t look as appealing as it stares at you through a plastic storage container tucked behind the garlic pickles and an expired jug of milk. Venison stew meat piggy backs with a bone in chuck roast. It was something like that in my family when I was growing up. We were a meat-and-potatoes family that raised Black Angus cattle, fished Minnesota waters, and hunted whitetails during the fall; lots of meat, lots of resteessen (leftovers). But my mother, a jägerin (huntswoman) herself, had an awesome solution: hand-ground, centuries-old, German jagerin wildfleicsch hash (huntswoman wild meat hash). Any day-old refrigerator roasts, whether venison or other game, typically became a breakfast skillet dish with the addition of Black Forest spices such as caraway, cold-boiled potatoes, and onion from the root cellar. Luckily, Mom is the granddaughter of German immigrant farmers and hunters. In fact, her great grandfather was a gardener for the Kaiser, Franz Joseph I, Emperor of Austria. From her lineage, she inherited a green thumb and a keen sense of food economizing. My brother, sister and I grew up learning it was senseless to waste a perfectly good meal. You know, “Think of all those starving children in . . . ” This moral underpinning of waste not, want not manifested in recipes comprised of homegrown and family harvested delicious fare with many creatively crafted leftover ingredients. And, to a clear understanding that venison was harvested to put in the belly, not hang on the wall. Big antlers were a bonus. Nowadays, the waste-not philosophy is evangelized by hunters who celebrate harvests with a nose-to-toes approach to processing, and by mindful chefs who have joined the food waste reduction movement and are making the Spartan ethic trendy; something that has long been a European concern and way of life. 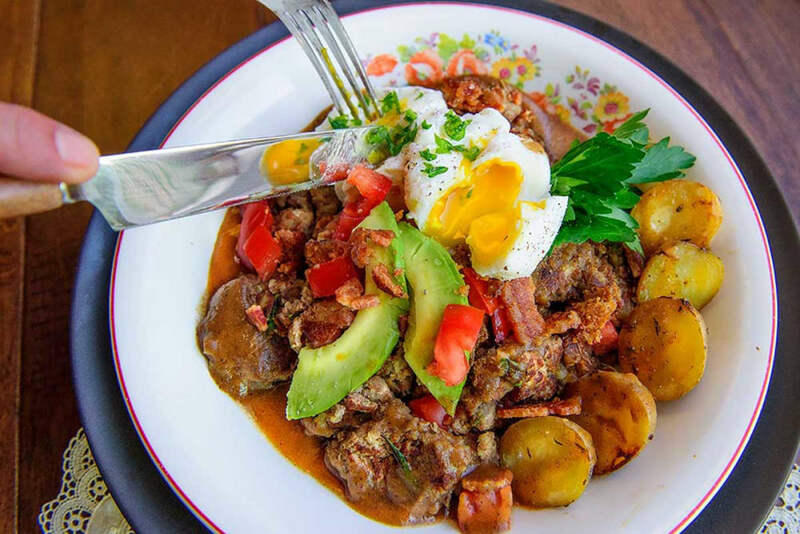 Venison hash topped with poached eggs, avocado, chopped tomato, and crumbled bacon and a simple brown gravy. So, push aside the pickles, make some cheese from the sour milk, recycle the plastic jug, and grab the Tupperware. Here is an everyman Huntswoman Venison Hash recipe inspired by Mom. Cold venison, cold-peeled boiled potatoes, onion and spices. Venison stew meat waiting to be browned. In preparation for this recipe, I seasoned and browned a pound of venison stew meat and threw it in with a 5-pound bone in chuck roast I made for Sunday supper. I took out the stew meat after 2 hours and refrigerated overnight. For the potato variety, waxy potatoes such as Blushing Belles , or yellow new potatoes, are an excellent choice and readily available. Either will deliver firm creamy texture and a mild flavor. More importantly, they hold together well when grinding. Blushing Belles where originally bred in Germany by one of the oldest breeding companies in Europe. Chill grinder parts in freezer. Along with the food ingredients, I pre-chill the grinder parts in the freezer. Cold grinds easier and helps keep things from sticking. Like anything, grinders run the price and feature gamut. For $30 you can pick up an old-fashioned hand-cranker like my mother used. Or, you can drop a cool $5,000 for a horse-and-a-half, 240V commercial unit that lets you squeeze out 20 pounds a minute. But how many leftovers do you really have? For my needs, I use the Chef’s Choice Professional Food Grinder Model 720; a rugged and reliable grinder from a trusted brand, with a powerful D.C. motor that can be a workhorse when needed, but compact enough to fit in the cupboard when not in use. Use a medium plate for ground hash. The Chef’s Choice Professional Food Grinder 720 has the versatility of three stainless-steel grinding plates, a sausage stuffing kit, overload protection, and a three-way control switch for grinding, stuffing, and reverse. Best part? All those advanced engineering features are built into a home-kitchen-sized, heavy-duty unit that retails around $180, and lets me grind hash quickly and easily. Dump meat, halved potatoes, diced onions and all seasoning and spices into the hopper. Mix by hand to evenly disperse the ingredients. Chef’s Choice Professional Food Grinder 720 pumping out venison hash. Gently push all ingredients through the feed tube and into the grinder with a plunger at a low setting. One pass through should be enough. Preheat a skillet over medium-high heat. Melt bacon grease and then add a small amount of hash to taste test. If you want more spices or seasonings, adjust before adding more hash to the pan. Toss in some sliced chives, or green onion tops if you like them. Fry until desired consistency. I like a crispy crust on my hash. Plate up and serve! I like to prepare poached eggs with silky, rich and creamy yolks that spill onto the hash when broken open. Some fresh avocado, chopped tomato or catsup, crumbled bacon and a simple pan gravy dress up the dish. Plated dish with poached eggs, avocado, chopped tomato, crumbled bacon and a simple brown gravy I made from the roasting juices from the chuck roast. About the Author: Raised a Minnesota farm-girl in a hunting family, Krissie Mason (below) is an outdoorswoman, food enthusiast, and has been reconnecting with her culinary country roots and family hunting traditions of late. She is the brains and brawn behind Scratch + Holler media, and a regular contributor to several outdoor websites. Krissie fully supports a field-to-fork wild food chain, and especially enjoys expanding pantries and stretching wild game palates with her ambitious and delicious wild game recipes. Be sure to visit Krissie’s website to check out her blog and much more.